Welcome to Cancer Australia’s 2018 October edition of From the Source. 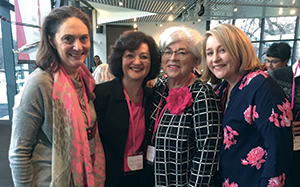 At Breast Cancer Network Australia’s Plan B Survivorship Conference held in Melbourne in August, Cancer Australia’s Dr Vivienne Milch, Director, Cancer Care, addressed the audience of women and men with breast cancer on the theme of the conference, “Living well beyond breast cancer”. Dr Milch outlined how Cancer Australia uses evidence to define best practice breast cancer care and leads improvements in cancer care, targeting initiatives in areas which will result in the greatest impact. She presented on Cancer Australia’s Principles of Cancer Survivorship which were developed to support the health and wellbeing of people living with and beyond cancer. Enjoying the day at BCNA’s Field of Women gathering at the MCG. 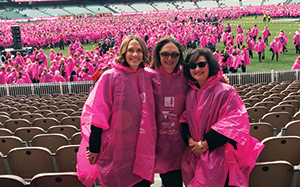 The day after the Plan B conference, Cancer Australia was delighted to join thousands of people in pink and blue ponchos at BCNA’s Field of Women on the MCG. The Field of Women took place to represent and acknowledge the 18,235 Australians who are estimated to be diagnosed with breast cancer in 2018. Breast cancer awareness is important for women of all ages, even if they are having regular mammograms. 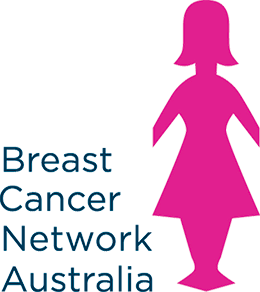 During Breast Cancer Awareness Month in 2018, Cancer Australia will promote breast cancer awareness and early detection for women of all ages, including younger women, and screening for women in the target age range. Cancer Australia will also release the latest evidence on breast cancer risk factors. GPs will also be reminded of the importance of following the triple test approach to ensure appropriate investigation of a new breast symptom, including in younger women. New stage at diagnosis data released on the NCCI website. In April 2018, Cancer Australia released, for the first time in Australia, national data on cancer stage at diagnosis, for the top five incidence cancers – female breast cancer, colorectal, lung and prostate cancers, and melanoma. Breast cancer is estimated to be the most commonly diagnosed cancer in Australia and is estimated to remain the 4th most common cause of cancer death in Australia in 2018. 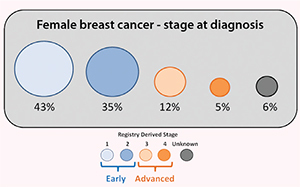 The new data reveals that the majority of cancer cases for female breast cancer (77%), prostate cancer (82%) and melanoma (92%) were diagnosed as early stage, compared to colorectal (46%) and lung cancer (18%). Cancer Australia Acting CEO Associate Professor Christine Giles said that the data on stage at diagnosis was a valuable piece of the puzzle, which had been missing from the picture of cancer control in Australia. The data can be accessed on Cancer Australia’s National Cancer Control Indicators (NCCI) website, ncci.canceraustralia.gov.au. In August 2018, Cancer Australia released the Optimal Care Pathway for Aboriginal and Torres Strait Islander people with cancer. The new, first of its kind, Optimal Care Pathway provides health services and health professionals across Australia with principles and guidance to ensure that cancer care is culturally safe and responsive to the needs of Indigenous people. Breast cancer is the most common cancer among women in Australia, including among Aboriginal and Torres Strait Islander women, yet Indigenous women are 16 per cent less likely to survive than non-Indigenous women. Key considerations in optimal care include a welcoming and inclusive healthcare environment; consultation with the local community; culturally respectful communication; recognising and respecting the importance of Men’s and Women’s Business; strategies improving health literacy; using culturally appropriate resources and considering patient circumstances and needs. The Optimal Care Pathway is accompanied by consumer resources, which outline what patients should expect on the cancer pathway, and the care they should be offered, from tests and diagnosis, through to treatment and care after treatment, management of cancer that has spread, and end-of-life care. 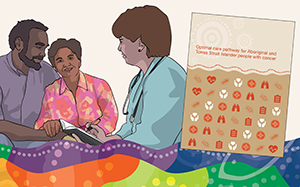 The Optimal Care Pathway for Aboriginal and Torres Strait Islander people with cancer was developed by Cancer Australia in partnership with the Victorian Department of Health and Human Services and in collaboration with Cancer Council Victoria. The Optimal Care Pathway and accompanying resources can be viewed at canceraustralia.gov.au. Find out about the latest developments in cancer research, prevention, diagnosis, treatment and care – subscribe to Cancer Australia Connect visit canceraustralia.gov.au/publications-and-resources/subscribecancer-connect-enewsletter. Cancer Australia provides national leadership in cancer control to improve outcomes for those affected by cancer and their families and carers.